The Battle of Épehy was a World War I battle fought on 18 September 1918, involving the British Fourth Army (under the command of General Henry Rawlinson) against German outpost positions in front of the Hindenburg Line. 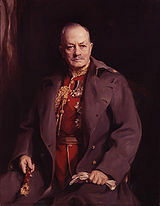 Field Marshal Julian Hedworth George Byng, 1st Viscount Byng of Vimy GCB GCMG MVO (11 September 1862 – 6 June 1935) was a British Army officer who, between 1921 and 1926, served as the Governor General of Canada. Known to friends as "Bungo", he was born to a noble family in Hertsmere, England, and educated at Eton College, along with his brothers. Upon graduation, Byng received a commission as a milita officer. He saw service in Egypt and Sudan before he enrolled in the Staff College at Camberley, where he befriended individuals who would be his comtemporaries when he attained senior rank in France. 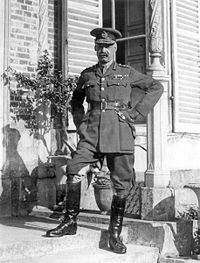 In following distinguished service with the British Expeditionary Force in France during World War I – specifically, in the Battle of Gallipoli, as commander of the Canadian Corps, and as commander of the British Third Army – Byng was in 1919 himself elevated to the peerage.